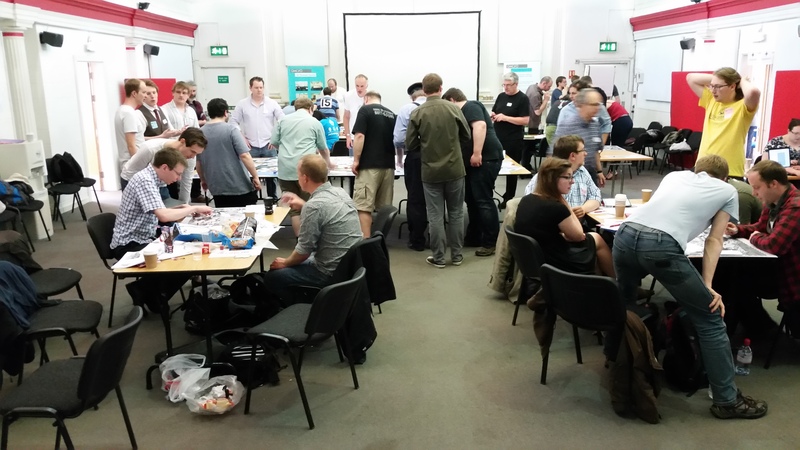 Don’t Panic Too- An Operation Sealion Megagame. 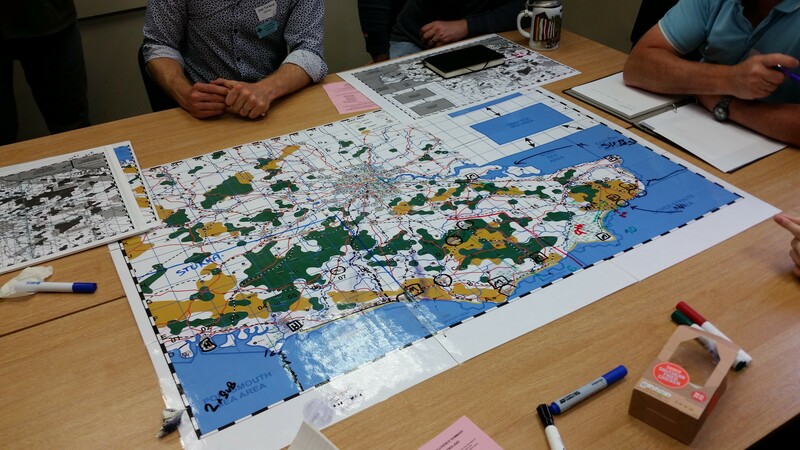 A couple of weeks ago I got the chance to try my hand at a ‘what if?’ megagame in Manchester based around the potential German invasion of Great Britain in the summer of 1940.
https://en.wikipedia.org/wiki/Operation_Sea_Lion_%28wargame%29 (I know it is a wikipedia page but it is fairly accurate). Personally I have the belief that the invasion would have never been launched anyway, even if the Battle of Britain had ended in the Luftwaffe’s favour. 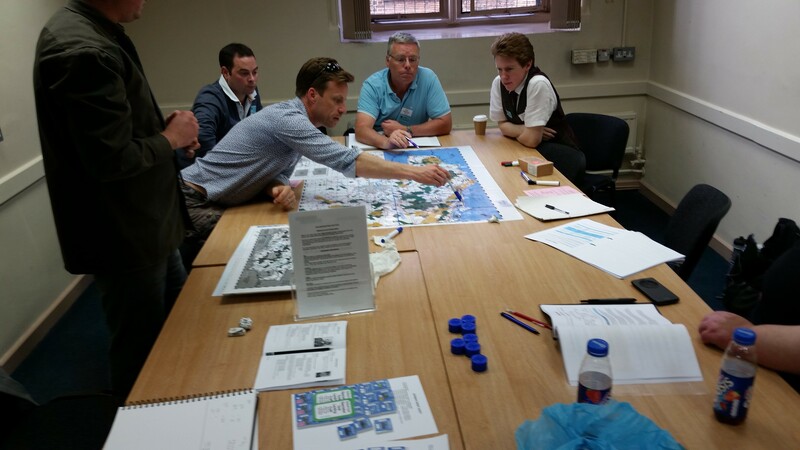 Still to make the game workable Jim Wallman the game designer had to alter history, I would be interested in seeing a list of exactly what was changed but it was fairly obvious that the strengths of both the Royal Air Force and the Royal Navy were downgraded. The game started off with a few hours planning the invasion, I had been given the role of the Luftwaffe/ Kriegsmarine Liaison Officer for the Heer’s Army Group A, this putting me in the team of the top level of command. This extended time to plan the first turn meant that we had a rather intense start to the game as we needed to come up with the plan and aims of our invasion. After some discussion the vision of our CO became clear: he envisioned a crossing of the channel at the narrowest point with the main thrust on our right flank, landing on the beach west of Folkstone, our left flank and most westerly point was to be a landing on Brighton’s pebble beach. The Luftwaffe were to provide direct support to our ground forces. The Kriegsmarine was to protect the sea lanes with a layered defence of U boats, mines, S boats and Destroyers. Once the initial landing was made the first priority was to take the ports of Folkstone and Dover. Once these were captured we would be able to land far more materiel than on a beach , mostly 7th Panzer Division who would then drive straight up the road to London. The Fallschrimjäger would drop inland to secure airfields and the town of Ashford. With this sorted out the remainder of the game would be devoted to managing the game as it unfolded, easier said than done as megagames by the simple virtue of having many players seems to throw up Clauswitzian friction better than any other game type I’ve played. One thing to note here is that the game was held in a new venue in Manchester that allowed the different levels of command to occupy side rooms separate to the map where the game was actually decided with dice and counters. Compared to all the other games I attended that have been held in one big room it certainly helped up as the highest level. Players would only come and visit if they had something important to tells us or to ask for (nine times out of ten this was extra logistics counters) or we told them to report to us for a briefing; this meant people didn’t just pop to our table for no reason. As a result we were able to take our time with the game and not feel under too much pressure. This was in marked contrast to the fast paced, pressure cooker environment around the main map. I think this physical separation really helped the feel of different levels of command and I look forward to further games at the same location. The organised chaos in the main room…. When the first turn started it was actually our quietest time as we knew that there would be a delay as information was filtered up the chain of command from Division to Corps (in the main room) to Army level (a different side room) before it got to us. What was clear after two turns was that the British had assumed that we would land in the west; the majority of their forces were deployed from Portsmouth in the west to Brighton in the east. This meant that our main thrust was facing relatively light opposition. That said our FJ drops was involved in a nasty fight for Ashford. The best news of all was the both Folkstone and Dover had not been sabotaged and were weakly defended with a Home Guard troops, just a battalion in each. The quick capture of both of these meant that we were pretty confident of getting our supplies across with some ease. With our most westerly forces in contact with the most easterly of the main British line of defenders which made the decision to use them to pin down as many of the British units as possible, hoping that they would become focused on them and not realize our significant push out from the east. This was rather unfortunate for the Army and Corp players in that area as they got no reinforcements from our reserves, very little in the way of logistical support but had to face the brunt of the British counter attacks (and a stonking great RAF air raid which flattened Brighton itself late in the game). As harsh as that may be it was necessary for the main plan to succeed. The Army commander pleads his case for more reinforcements to be sent to the bleagured troops in Brighton. A few turns in it became apparent to me that the Luftwaffe and Kriegsmarine players were more than happy to come to us to keep us abreast of what they wanted which allowed our CO to give them their instructions at the same time; this did mean that my cast role as Liaison was somewhat redundant…. However I did find something to do and re -rolled my self as a propagandist. The game featured a pair of players taking on the role of the supposedly neutral media who could influence both the British public’s morale and the opinion of still neutral America (though I can’t blame them for being pro British really). I really got into writing communiques managing a page of A4 scribbles every hour or so. In fact I may have enjoyed it too much as I was pulled aside by control for trying to extend my influence in the game beyond my remit. In my defence that was never my intention when I wrote that Franco wanted Gibraltar back it wasn’t an attempt to bring a Spanish dimension to the game rather it unsettle the players with a piece of complete disinformation. I really enjoyed my new role and am pleased that I had the ability to expand on it throughout the game, even bringing in Lord Haw Haw to directly address the British public. In fact I would have liked to have seen the political aspect expanded upon if the game ever gets re- run; also I’ll choose a similar role if I see any in future games. After 7 PzDiv had been landed it made fairly good progress up the road to Chatham, after the FJ had cleared Ashford albeit with heavy losses. If the British had been aware of these gains they seemed to not move much in the way from Brighton’s beach head to try and intercept us. By the time the game was called there was only a Home Guard unit, a Division HQ and artillery park between us and London; we had even managed to fly in an air-landing brigade to protect the left flank of the Panzers’ advance. I was fairly confident that in another turn or two we would have got into London itself, which did seem to be rather undefended. The main map at the conclusion of the game- the first time I actually got to have a proper look at it. We were helped by three major factors: most of all the British had misjudged their initial deployment and never really seemed to move from it throughout the game. The Kriegsmarine player did a fantastic job against some pretty stiff odds to get plenty of units landed as well as their vital logistics too- he was far more successful than I thought possible, at the game’s end he pretty much controlled the channel and was planning to breakout past Cornwall into the Atlantic after a few capital ships of the RN had been sunk. Thirdly the RAF were never the threat that I thought they would be, our Luftwaffe did a good job keeping them away from our forces; speaking to others after the game it seemed that the air combat for both sides were pretty ineffective. All in all another great day’s gaming and a nice new venue that I hope will be used again in the future. 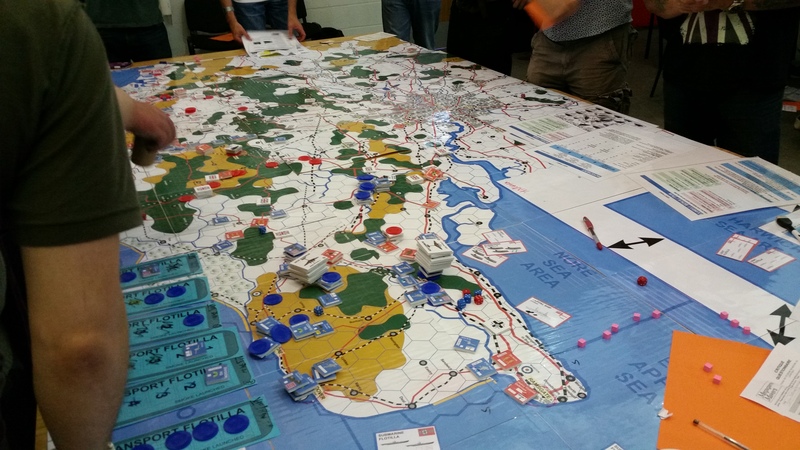 This entry was posted in Uncategorized and tagged megagame, megagame makers, Operation Sealion, WW2. Good report, I agree with your comments that; we would probably have taken London, the Luftwaffe and Kreigsmarine did possibly a little too well. I did read a history of the planned campaign before the game. Supplies. Even if the Germans got all the channel ports intact (which we did amazingly, blunder by limeys), they would have struggle to ship sufficient supplies across the keep their divisions moving. I think the book suggests the Germans wanted to bring about 9 divisions across in total (over a few days/weeks). The supply situation wasn’t perfect in the game, but we basically had enough. Tides – the tide wasn’t simulated at all. If you want to avoid hauling your stuff through thick mud there are was about a 1-2 day window over which you could really land. This sort worked out as the bulk of the landing was done over the first 4 turns, but it was stretched a little. British divisions numbered somewhere between 17-25 from my memory of the book. Now they were not all that well equipt and some had never done divisional scale manouvres never mind combined arms training etc. Also some were in Ireland and scotland and so wouldn’t arrive in the time scale of the game (how many turns where there? i think about 8, so 4 days). But i would expect a few more divisions to arrive within that time frame if an invasion where to have occurred. Thanks for the extra info Simon- it’s appreciated. Isn’t the corollary from your RN comments that if they RN does steam into the channel and stop the invasion fleet, something that they wouldn’t find too hard really, but takes heavy losses (am thinking here from landbased aircraft would they risk it? If the losses did occur and the invasion was stopped but the RN left too weak to contiue defending the UK sea lanes, i.e. the KM did break out, could we have been starved out in a few weeks anyway? I am playing Devil’s Advocate here (and I’ll freely admit that WW2 naval isn’t an area I’ve looked into much) but isn’t the RN decision a little tricky as they wouldn’t have wanted to commit at the wrong moment? yeah, I agree its not an easy situation for the RN, but if london is going to fall, surely it takes priority over longer term goals. having trade routes and an empire is all well and good but if your capital is gone its not going to gain you much, so i expect the RN would have been thrown in. Im not actually sure what the OOB was for the RN in the game, or real life for that matter. Be interesting to see who actually had the bigger fleet in the game. one other realism issue occurred to me. The germans didn’t have a proper barge/landing craft or transport fleet. According to the book I read, they were rounding up long boats from dutch canals and taking off the tops. I suspect we were given more transport craft than historically would have been available. It is a tricky decision for the RN but I feel it is made easier by the scenario- it is obvious that the game is about the German Invasion; it would be interesting if you could somehow seperate the teams so that the British team think they are playing a game about the first 18 months or so of the war in general and only the German team knows that the game is specifically about Operation Sealion. The idea being that this would mean that the Brits would play for a longer game rather than a short termist view driven by the scenario.Not sure how achivable this would be in real life though. Do you know any British team players who kept their briefings? I’ve got copies of all the German sheets still. They should have the listings. As for real life I’m not sure. On the subject of barges and ships taken up from civilian sources it could be informative to look at the Norway campaign to see how the KM performed there. The 1st Sea Lord and the commander of the Home Fleet were in agreement that capital ships were not to sail into the Channel unless the Germans sent their capital ships there, too. They stated this multiple times in Chief of Staff meetings and got it approved by Churchill and the COS. They retained this attitude right up to 1942, when they refused to put anything bigger than a destroyer in support of the Dieppe raid. They knew that their anti-aircraft directors were not designed to protect against dive bombers and they did not like what had happened to their ships in Norway. 2/3 of the 40+ destroyers involved in Operation Dynamo were non-operational at the end of the Dunkirk evacuation due to a variety of factors but the major factor was air attack and from July 1940 RN ships were forbidden from operating in the Channel in daylight. it was also felt that the confined seas, shallow waters, and multiple navigation hazards made the Channel a particularly unsuitable place for capital ships especially when there were 50 or so destroyers and light cruisers available for the job. If 40 destroyers were lost defeating the invasion then the Battle of the Atlantic would have been lost. The Home Fleet was also needed as a bargaining counter with the Americans and to safeguard any evacuation should that become necessary. Thanks for that extra info Christopher. I didn’t know that about the capital ships and the paucity of destroyers.